Use of the kitchen mortar and pestle has been well documented throughout history, and is even mentioned in the Bible. When manna fell from heaven, the people of Israel used a mortar and pestle to process the manna before baking it into cakes (Numbers 11:7-8). The mortar and pestle has been used in cultures around the world since before recorded history to prepare a variety of food grains and spices for cooking. Foods commonly made with a mortar and pestle include guacamole, gazpacho and pesto, but one of the most common uses is grinding herbs into powder. Since they come in a variety of sizes and materials, it is important to keep in mind what you will use it for when looking for one for your kitchen. I use mine for crushing dry herbs into powder, including peppercorns and dill leaves, to bring out the flavors. I have also used it to make a paste of honey and cinnamon to use in bread baking. The one I have is a heavy glass mortar and pestle , but I would much prefer something with a little more character, such as the flying saucer style close to the bottom of this page. Some, such as the stoneware Le Cruette Mortar and Pestle, Marseille pictured below, come in gorgeous colors, while others are made of ceramic, glass, porcelain, metals, wood, marble, stone, or granite. This high-fired stoneware mortar and pestle has a colorful enameled exterior that resists chipping and cracking. Le Creuset has this in several attractive colors. The interior is unglazed and has an abrasive interior and pestle tip which makes it more effective in crushing and grinding herbs. 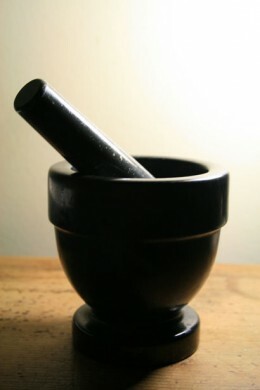 The mortar and pestle also has a significant history of use in the medicinal and chemistry fields. Many pharmacies still use the RX mortar with pestle as a symbol in their logos. There are times when a pharmacist must mix medicines to put into capsules. While this doesn't happen as much as it once did, the symbol gives a nod to the past. However, it is important to note that if it is used to crush medicine or any type of chemical, it probably should not also be used for food preparation. This includes making herbal medicines from fresh or dried herb. It is best to purchase a separate set for medical use. 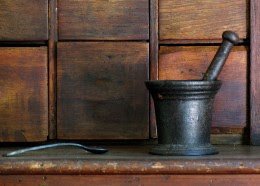 Do You Use a Mortar and Pestle in Your Kitchen? Please leave a comment below and let me know.